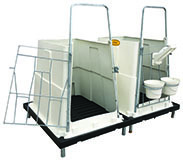 Designed for starting new-born calves off to a healthy start, up to one week old. Effortlessly switch between individual and paired housing. Multiple "flexible" setup configurations and can be extended to any length you wish. Drop-In-Go Pen system offers quick assembly and disassembly, with the option to mount units back to back.